Renovating an apartment in Tbilisi is not an easy task, especially when it comes time to finding a reliable partner who does a good job and who does not have a heavy hand when it comes time to draw up an invoice. Gurian Partners relies on a small group of companies and craftsmen in whom we have total confidence. This confidence has been acquired over time and through our collaboration. Quality renovation is one of our three priorities. Why? Because it affects quite simply the rental price. A good renovation, using the right materials and with good finishes, is the guarantee to increase the rental yield rate. We pay great attention to the materials used as well as to the delivery times. How much cost for an apartment renovation in Tbilisi? The cost of renovations in Tbilisi is generally not very expensive. Once the quotation has been established and validated, Gurian's teams follow the worksite from A to Z. We monitor it on a daily basis. Each project is unique and has its own specificities. A space optimization work, done by our architect, that requires demolition and reconstruction is not the same as if it is a refreshing, even in depth. The price will vary according to many settings, necessary plan changes, doors and windows to change, water spots to move, etc...Each real estate investment project is different. Why invest in real estate in Tbilisi? Do you need a visa to come to Georgia? Can a foreigner open a bank account in Georgia? May a foreigner purchase a property in Georgia? A successful real estate investment requires a purchase at the best price. We work with strict requirements to find you the best deals in Tbilisi. Buying at the right price will allow you to increase the rental profitability of the project. See our real estate investment advice in Tbilisi on our blog. Our architect and designer optimize the renovation plan taking into account local rental demand in Tbilisi. 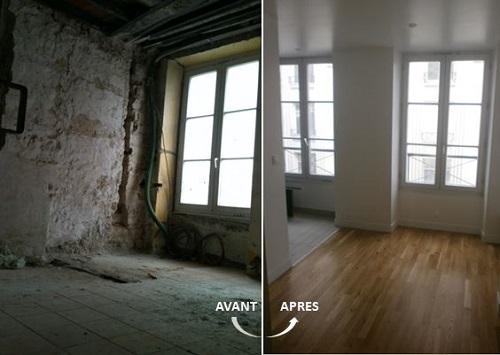 A renovation of quality and a decoration "coup de coeur" will make it possible to rent your property at the best price. We work with serious construction companies to make the renovation of your apartment, a success. Investors who apply to Gurian Partners have different criteria. Whatever your criteria, a rental property investment must take into account the notion of profitability. We provide you with the advice you need to optimise your return on investment. Georgia is a small country in the Caucasus bathed by the Black Sea, with 3.7 million inhabitants and an area of 70,000 square kilometers. It shares borders with Russia, Turkey, Azerbaijan and Armenia. Its capital is Tbilisi and represents one third of the total population of the country. Georgia, the former Republic of the Soviet Union, has undergone an amazing and remarkable transformation over the past decade. Georgia has become in a few years a great destination to consider to invest, start a business, buy a property and get residence. Gurian Partners is a French-Georgian real estate investment company in Tbilisi, capital city of Georgia. We offer real estate investments with complete renovation for an optimized rental return on investments. We search, find and buy the best deals on the market, in the most attractive historic districts of Tbilisi where rental demand is strong. Our team offers you a turnkey service that allows you to make a profitable rental investment, while delegating the entire operation to us.